The "progressive" reading of history focuses on two major antecedents for the origins of the United States' 1898 war with Spain: the 1896 presidential election and the Hearst-Pulitzer press war that, reportedly, generated an irresistible clamor from an "aroused public." Underlying those narratives are two very different theoretical frameworks: a class-dominance view and that of the mass society. 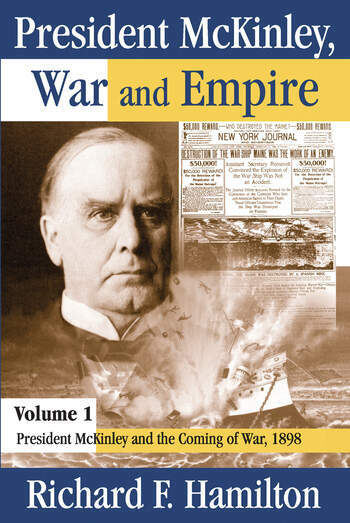 Volume 1 of President McKinley, War and Empire assesses the adequacy of those readings. In the 1896 election the Republicans, led by William McKinley, were challenged by William Jennings Bryan, a radical and an inflationist, who had defeated the conservative leaders of the Democratic Party. The Bryanites portrayed the 1896 election as a struggle between "Wall Street" and "the people." McKinley was portrayed as a docile, pliable figure whose campaign was directed by an adept Ohio business magnate, Mark Hanna. The McKinley victory meant that "big business" was now "in control." The Cuban insurgency, begun in 1895, gained attention and support from the American newspapers. This began with a circulation war in New York City, with Hearst and Pulitzer publishing "sensational" reports about the struggle in Cuba. The resulting public clamor, it is said, overwhelmed the members of the legislative and executive branches. McKinley and his advisors fended off those demands as best they could but, following the sinking of the Maine, he conceded and asked Congress to authorize intervention. This work provides an original assessment of those long-standing claims, the basic elements of the progressive history. It reviews McKinley's biography, principally the events leading up to his election victory, including discussion of Hanna's role. It then examines the events leading up to the war. Studies of press content are reviewed and new material is introduced. The work also argues that two other factors were decisive: the efforts of an adept Cuban pressure group and partisan politics. The theoretical implications are explored and an alternative framework, elitism, is argued. The result is a different, a more complex view of the origins of the war.